If you are planning to travel internationally, it is sometimes difficult to keep track of everything to bring while not overpackig. What is the weather going to be like? Have you packed the right clothes? Are you carrying all the necessary documents? For your convenience, we’ve compiled some travel packing tips to get you started with your preparations. Unlock your bags as airport security screeners may break the locks to see what is inside your carry-on. Avoid over packing your bag. Sometimes airport personnel may select your bag for inspection. After inspection it may become difficult for you to close the luggage which can result in damages, overcharges or a delay in you getting to your gate on-time. Always carry ziplock plastic bags for items that can leak or break while in transit. 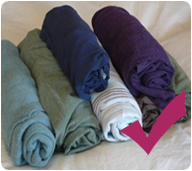 Always roll your garments like jeans, t-shirts, pants etc to save space and avoid wrinkles. 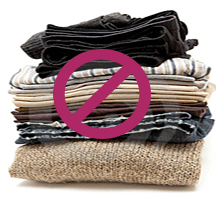 Try packing clothes with fabrics that require little care. Choose clothing items based on climate and events that you will attend. Carry-on baggage means customers are restricted to one carry-on item and one personal item. Personal items include handbags, cameras, laptop computers etc. Carry-on luggage should not exceed overall dimensions of 55 inches (length + width + height). Carry-on baggage must also fit under the seat or in the overhead bin. Do not try to bring a bag that you know is larger than the carry-on allowance. .
Photocopies of your important documents like passport etc. Keep the photocopies and originals in separate places. Remember Less is More! Travel with one piece of luggage is easy for traveling through the airport and to your other destinations. If you are considering a multi-destination trip, lugging one bag doesn't sound so bad. Sit Back Relax and Enjoy Your Flight!